As of January 2, 2017, the Revised Worker Protection Standard (WPS) regulations require that only EPA-approved training materials be used for WPS-required training. This includes all training materials used for pesticide safety training of Workers or Handlers; as well as the training materials used to train Trainers of Handlers and/or Workers. All EPA-issued training materials are EPA-approved*. WPS training materials that are developed and issued by EPA will bear the official EPA logo and have an EPA publication number. 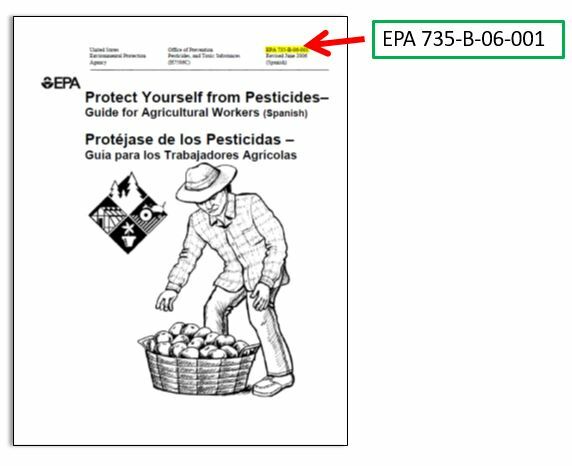 For example, if you used the “Protect Yourself from Pesticides” training material for workers for your 2017 training, you would record the EPA approval number EPA 735-B-06-001. However, WPS pesticide safety training materials that have been developed by organizations other than EPA (including States) must be reviewed and approved by EPA. These materials should bear an EPA approval number and a statement indicating the materials have been approved by EPA to meet the requirements of the WPS for worker or handler training materials. Additionally, the revised federal WPS regulations require that agricultural employers keep and retain training records that include the EPA approval number of the training materials used, using the EPA publication number or approval number. The requirement to record the EPA approval number of WPS training materials is decidedly more stringent than the current New Jersey Worker Pesticide Safety Training regulations at NJAC 7:30 12.8 (q) and (r), and Pesticide Safety Training for Handlers at NJAC 7:30-12.16. The United States Environmental Protection Agency (EPA) is providing resources to agricultural employers and handler employers to assist with compliance with the Revised WPS in conjunction with the Pesticide Educational Resources Collaborative (PERC). The PERC website serves as a repository of EPA-approved training resources. PERC will use email distribution lists to keep interested parties informed about new publications. PERC has developed lists for several target groups, including “Agricultural Employers and Handler Employers” to distribute notices relevant to agricultural employers and commercial pesticide handler employers, as defined by the WPS. See http://pesticideresources.org/lists.html to enroll in the PERC email list(s) of your choice. At any time you are welcome to become acquainted with the many resources of PERC. It has a large repository of EPA-approved resources, as well as items that have not been approved. The difference may not to self-evident to those not accustomed to PERC’s program and website structure. Thus, we are providing below a “quick-connect” selection of some of PERC’s EPA-approved training videos and other materials for you. Resources below are further identified by audience (workers or handlers or both). Resources that EPA has approved for the training of handlers may also be used for the training of workers. The first section provides NEW resources that contain the expanded training content of the 2015 Revised WPS. You can start using these immediately; and we highly recommend that you do! Video (English) – Agricultural Worker and Handler Pesticide Safety Training (MP4). Iowa State University. May 11, 2017. Video for training agricultural workers about pesticides and the Revised Worker Protection Standard (WPS). This video satisfies the pesticide safety training requirement for both handlers and workers under the revised WPS effective January 1, 2016, and is approved indefinitely. EPA Approval # “EPA W/H PST 00022”. Length: 38 minutes. Video (English) – Pesticide Safety For Agricultural Workers (MP4) (YouTube). Video for training agricultural workers about pesticides and the Revised Worker Protection Standard (WPS). This video satisfies the pesticide safety training requirement for workers under the revised WPS effective January 1, 2016, and are approved indefinitely. EPA Approval # “EPA Worker PST 00001”. Length: 18 minutes 28 seconds. Video (Spanish)- Seguridad Con Pesticidas Para Trabajadores Agricolas (MP4) (YouTube). Pesticide Safety for Agricultural Workers (Spanish). Aprobado por la EPA (número de aprobación “EPA Trabajador PST 00001”) video de capacitación para el entrenamiento de trabajadores agrícolas sobre pesticidas y la Norma de Protección del Trabajador (WPS). Video for training agricultural workers about pesticides and the Revised Worker Protection Standard (WPS). This video satisfies the pesticide safety training requirement for workers under the revised WPS effective January 1, 2016, and approved indefinitely. EPA Approval # “EPA Worker PST 00001”. Length: 18 minutes 28 seconds. Resources developed for the training of Worker and Handlers per the requirements of the 1992 Worker Protection Standard (as amended) may no longer be used effective December 2018. EPA the availability of training resources with the Revised WPS expanded content. Do not use training materials unless they are approved for use with the 2015 Revised Worker Protection Standard. Note: Interim guidance for the public for instances where the two rules differ is pending from NJDEP; check their Worker Protection website for more details on this. For specific questions or concerns about NJDEP’s implementation of the revised WPS, please contact Nancy Santiago at 609-984-6568 or email Nancy at: pcp@dep.nj.gov. Please let us know if this information was helpful: https://njaes.rutgers.edu/eval/ . Thanks!